Shopping, health appointments, youth activities, or simply your daily commute. Simply call the day before to schedule a ride or set up a recurring pickup schedule. It's up to you. Our friendly, courteous drivers will get you there safe and on time. Need a helping hand? We have you covered. Our buses are wheelchair and handicap accessible. You can even bring your bike along for the ride. On-demand, on time, reliable public transportation. 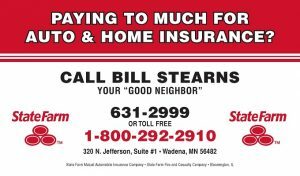 We serve the cities of Wadena and Staples in addition to locations throughout Wadena County and Northern Todd County. And our service routes keep growing right along with our ridership. If you haven't ridden with us in a while, we encourage you to give us a call. Enjoy curb to curb transportation on a comfortable, clean well-equipped bus. Turn your daily commute into productive time. Or simply make your journey a bit more entertaining. All our buses now offer free WiFi. Sometimes it's the little things that make life (and a bus ride) just a little more enjoyable. Soon, you will never have to scramble to find correct change for bus fare again. Soon you will be able to purchase your tickets and monthly passes online. Until then, please continue to purchase tickets and passes by contacting our office or talking to a bus driver. Your kids want to be in activities but how do you find time for all that driving? Easy! Allow us to do the driving for you. We'll get your kids to and from all their activities safely and on time. Call today and get your kids signed up! We are grateful to many local organizations who support public transportation for our community. Friendly Rider can provide more services to more of our community due to a commitment from the following businesses. Is advertising on our buses right for your business? For more information, give us a call at (218) 631-5730. Need more reasons to ride? Turn your "why?" into "why not!" Friendly Rider is great for all ages, all stages, and all abilities. Ditch the gas pump, traffic, parking, and the MN weather hazards. Schedule your trip today!